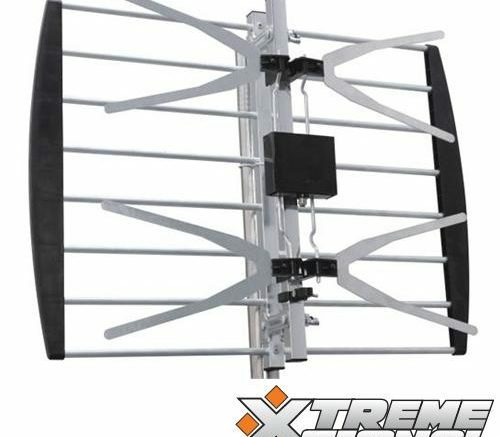 In this panel antenna, the X's should be closer to the towers than the horizontal bars. Broadcast TV has changed a lot over the years. Starting with an analog black-and-white signal in the 1940s, TV first went to color, added captioning, went stereo, added multiple audio tracks, and without a doubt the biggest jump was the mid-2000s move to digital broadcasting. Today’s TVs share almost nothing with a TV made just twenty years ago. It’s a pretty impressive testament to the staying power of video. Antennas have changed, too. Sure, the basic physics are the same so that an antenna that your dad (or the previous homeowner) put up in 1965 probably still works for you, but today’s antennas are smaller yet more effective than ever before, thanks to advances in manufacturing, lower material cost, and improvements in electronics that make low-noise amplifiers and inexpensive baluns commonplace. Will it all come to a screeching halt in 2017? Believe it or not there was a time I would have said “maybe.” Streaming has grown at such an incredible pace, and it’s easily overtaken the number of people who get their video entertainment from nothing more than an antenna. That number is expected to drop as most cord-cutters will continue to embrace streaming. I’m a lot more optimistic than I was a year ago, however. The FCC hasn’t released firm numbers, but it’s clear from their actions that they’re not seeing hundreds of station owners coming forth to sell back their broadcast licenses. That’s a good sign for the future of broadcast TV. 2017 will be the first year that absolutely no cable or satellite company sells an add-on to allow antenna TV to be integrated into their services. Even TiVo, which originally allowed almost nothing but antenna TV, has moved away from it, with its only antenna product being last year’s Roamio. While there are a number of DVR options for antenna TV, it’s going to be a bit harder to watch in the coming years. On the other hand, people are already accustomed to switching sources on their TVs to get to streaming devices so maybe the jump won’t seem so jarring. Antenna technology will continue to advance in 2017, with Solid Signal leading the way in affordable and quality antennas. These aren’t your granddad’s antennas… these are smaller and yet more powerful. That doesn’t mean the old ’60s-style yagi on your roof will stop working, but you’ll have more alternatives if you want to upgrade. Smaller will work be even better in 2017. If you’re looking for great programming over your antenna in 2017, this promises to be the best year ever. Broadcast network TV is finally improving and you’re seeing some real quality shows that rival what you would normally find on cable or streaming. On the other hand, with an antenna you can see shows as they were meant to be seen… live and on time. It’s just not the same watching “Have Gun, Will Travel” on a streaming box. Sit back, relax, and enjoy… that’s the promise of TV in 2017. So, what do you think 2017 will bring in the world of over-the-air TV? Will it be better or worse? Let us know… leave a comment!